TALLAHASSEE, Fla. — Two games, two shutouts for the Seminoles as No. 1 Florida State improved to 4-0 on the season after an 8-0 win in five innings over UNCG (1-3) and a 5-0 victory over Iowa State (1-2) to close out the day. In addition to the strong performance in the circle, the Seminole offense shined on Saturday as FSU tallied nine extra-base hits on six doubles, a triple and two home runs in the pair of victories. Meghan King tossed her second complete-game shutout of the season and has now won each of her last 14 decisions, dating back to April 28, 2018. She has allowed just one earned run over her last 55.0 innings pitched, dating back to the NCAA Super Regionals against LSU on May 26, 2018. Prior to Florida State’s first game of the day, Dr. JoAnne Graf throughout the ceremonial first pitch. 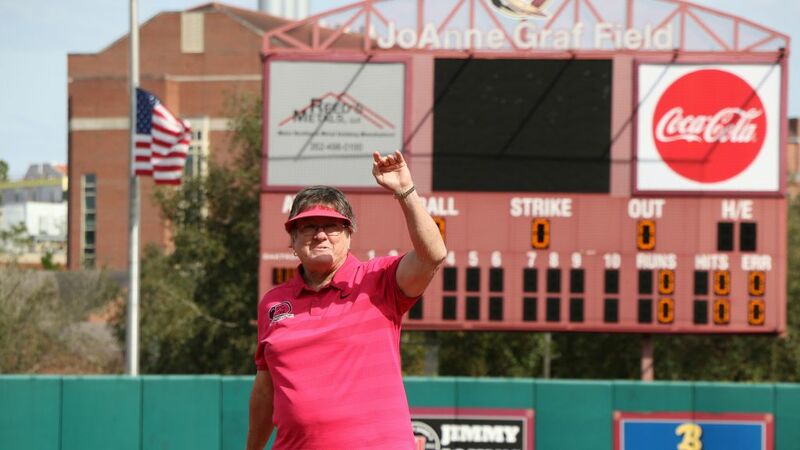 Standing on the field with her name on it and involved with a tournament named after her, Dr. Graf was celebrated for her Hall of Fame career at Florida State that included 1,437 wins, 10 ACC Championships, seven trips to the Women’s College World Series and the 1981 and 1982 AIAW National Championships. Florida State broke out to an early 3-0 lead in the bottom of the first inning against UNCG, as Cali Harrod led off with a single up the middle. She quickly stole second and scored on an RBI single by Carsyn Gordon put the Noles on the board. An RBI double by Elizabeth Mason added to the lead and Dani Morgan’s RBI single up the middle closed out the FSU scoring in the opening frame. The Seminoles added two more runs in the bottom of the third, highlighted by doubles from Sydney Sherrill and Anna Shelnutt. Zoe Casas added an RBI single to push the FSU lead to 5-0 after three complete innings. Kathryn Sandercock earned her first career start in the circle and posted a five inning shutout. The Spartans managed to get runners on the corners in the top of the first, but the freshman got out of the jam with a groundout to third. She scattered three hits over the final four innings and allowed just one runner to reach second base for the rest of the game. She finished with five strikeouts and one walk as she improved to 2-0 on the season. Florida State ended the game in the fifth inning, bringing across three more runs for the 8-0 final score. Sherrill and Mason hit back-to-back solo home runs to start the inning and freshman Morgan Noah followed with a double to left center. A line out to right field moved Noah to third base and she scored on an RBI groundout by Casas. Sherrill also sparked the Seminole offense to start the game against Iowa State, driving in runs on RBI singles in both the first and third innings, scoring Harrod both times. Florida State added another run in the fourth inning as Cassidy Davis chopped an RBI single over the ISU third baseman, scoring Morgan, who led off the inning with a triple to right center. FSU starting pitcher Meghan King was outstanding in the circle as she did not allow the Cyclones to register a base hit until the top of the fifth inning. She retired 13 of the first 14 batters she faced in the game and allowed just one more hit the rest of the game on a double in the top of the sixth. King finished with seven strikeouts and allowed just one walk and two hits over 7.0 innings of work. Florida State closed out the scoring with two more runs in the fifth inning for the 5-0 final score. Gordon lined a leadoff single, but was replaced at first on a fielder’s choice by Sherrill. A single by Shelnutt set the stage for Morgan to drive in another run with an RBI double into the left field corner. Casas brought in the final run with an RBI single to bring in Shelnutt. The Seminoles will close out the JoAnne Graf Classic on Sunday with a game against UNC Wilmington at 12:30 p.m.